The art of improving a land area into something more distinct and more customized, so to speak is what landscaping is all about. Landscaping has been here for centuries and today modern technology allows us to improve our land area better than what our ancestors used to do. Now, there are landscape architects and designers solely concentrated on improving their craft not only through the use of their skills and creativity but as well as with modern tools and technology. Any backyard or outdoor area can be transformed into a beautiful place with the help of landscaping experts. Landscaping is not an easy job. It may involve complex tasks that require expertise and creativity. Rainbow Acres Landscaping knows this fact so we only employ the right people and use appropriate tools for the landscaping job. Landscaping usually involves three main phases. All of the phases in any landscaping project require special planning and brainstorming. Terrain – The initial stage may include changing of the land through processes called grading, terracing, mounding and backfilling. This is usually used for larger land areas. Plants – Plants are significant in any landscaping project. Whether the landscaping project is residential or commercial, plants are not simple additions to the design but a major part of the landscaping process. Plants are added in land areas to enhance the space and add a distinct personality to it. Another way people call this category is softscape. Structures - Landscaping professionals include structures to add an extra living space (i.e. patios, decks) or perhaps adding water features like pool, ponds or waterfalls. It also includes fences, walls and other built features. This is more popular as hardscaping. 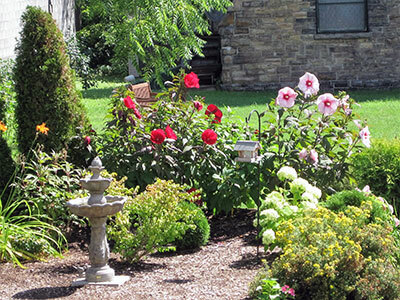 Landscaping companies and professionals abound in the country. But what makes one distinct over the other is not just affordability of their services but also the skills of the professionals they have not to mention yet the quality of service. These distinct characteristics make Rainbow Acres Landscaping a cut above the rest. Our skilled professionals are highly trained and have extensive experiences. Sometimes, skills are not the sole determination of quality work but experience as well. We make it a point to continuously train our staff, not only as regards to landscaping but also with regards to customer servicing. We boast of state of the art tools and equipment and use high quality materials in all of our landscaping works. But that does not mean that our cost is beyond affordability. We also are proud that our costs are so flexible that majority of our Vermont clients could not thank as enough for the quality of service that we give them and the affordability of the investment they dream to have. We specialize in both residential and commercial landscaping from simple stonework to a more complex landscaping job. If you need maintenance and lawn care, we also offer that service - as clamored by majority of our customers. We value trust - that is the reason why our clients keep coming back for more. We are serving major areas in Vermont like Addison, Vergennes, Bristol, Middlebury, Brandon, Burlington, South Burlington, and Essex Junction. We also provide landscaping services to Jericho, Montpelier, Northfield, Rutland, Barre, and Waterbury residents. Let us help you create a beautiful landscape that also reflects your personality. Call us now.